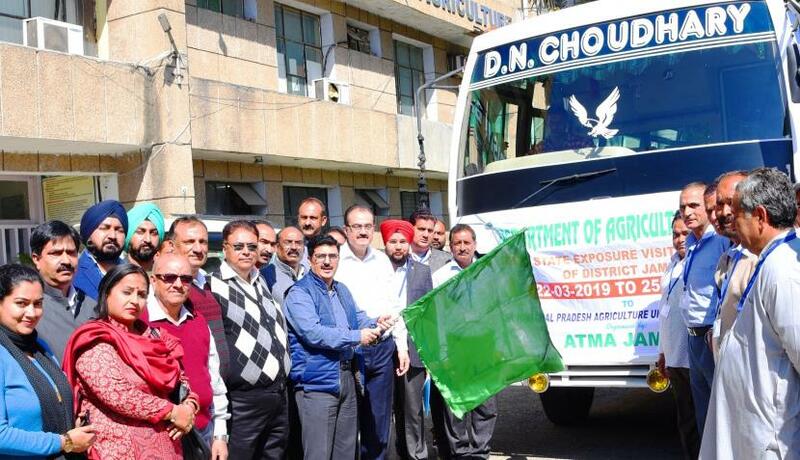 JAMMU: An Inter-State Exposure visit of a group of 25 farmers belonging to different parts of Jammu district was flagged off by Director Agriculture Jammu P. S. Rathore here from Directorate of Agriculture, Krishi Bhawan. The group of farmers belonging to Marh, R. S. Pura, Akhnoor areas of Jammu district will visit to CSK Himachal Pradesh Krishi-Vishav-Vidayalaya (CSKHPKVV) Palampur. The four-day visit has been arranged under Sub-Mission on Agriculture Extension (SAME) of National Mission on Agriculture Extension and Technology (NMAET). Director Agriculture, while interacting with the farmers, said that the exposure visit is being organized for acquainting them with Integrated Farming System including Organic Farming, Mushrooms Growing, Beekeeping, Animal Rearing, Vermi-composting, Vegetable Cultivation and Cultivation of Spices and Medicinal Plants. He advised the farmers to interact with the scientists and research workers to get the clarifications regarding latest techniques being adopted in the farming. He asked the farmers to utilize the technology in their fields after learning from the trainings for doubling their farm income by 2022. Area Development Officer (Veg), Jammu S. K. Langer informed about various farmers' visits organized within and outside the state under the scheme. He informed that one day exposure visit for 500 farmers of Jammu District was arranged to SKUAST-J and that of 150 to KVK Kathua during the year 2018-19 under Sub-Mission on Agriculture Extension (SMAE). Deputy Project Directors, Agriculture Technology Management Agency (ATMA), B. B. Sidha and Ravinder Kachroo, District Agriculture Officer (Ext), Jammu D. K. Bakshi, Agriculture Information Officer, J C. Raina, SDAO Marh Munshi Ram and other field functionaries of the Department were also present on the occasion.